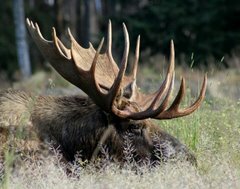 Moose Tracks: Millions Support Slandering the "Prophet""
... it was a part of a moral equivalence litany that equated anti-Islam statements with abusing women, making too much money, destroying the environment, and other things which BO on some occasions finds to be "bad things". The administration also condemned Charlie Hebdo for publishing cartoons that might be offensive to Muslims in 2012. BO put the man that made the anti-Islamic movie that was used as his first cover lie for Benghazi in jail. There doesn't seem to be much question that his heart lies with having people like Charlie Hebdo SHUT UP! One can imagine that BO is ambivalent at best about the happenings in Paris. You notice there are no calls for more gun control as there would have been with pictures of men dressed in black swaggering down streets and executing a policeman with a full-auto burst in the US. Such pictures in a country with completely oppressive gun control serve to remind the average American sheep that the idea that a government -- even one as massive and entrenched as the one in France, is ever going to keep you secure is just one more "you can keep your life if you like it" lie! As I imagined myself following Malcolm X's call, one line in his book stayed me. He spoke of his wish that the white blood that ran through him, there by an act of violence, might somehow be expunged. I knew that, for Malcolm, that wish would never be incidental. I knew as well that traveling down the road to self-respect my own white blood would never recede into mere abstraction. I was left to wonder what else I would be severing if and when I left my mother at some uncharted border. BO also connected with Nation of Islam politically in Chicago. Since the "Dreams" which BO documents as picking up from his father in the book are the dream of destroying the colonial overlords, it is easy to understand why going to France (full of white blood) to march in solidarity with the colonial powers is just not something BO feels comfortable with.